Combining items in your store into pre-made sets can be a great way to give shoppers new gift ideas during the upcoming holiday season. And as you can see from this photo taken on a recent visit to Bennington Potters in Vermont, all it takes is a bit of ribbon or twine. Gifts sets also allow you to cross-merchandise, promoting different areas of your store. Everyone expects Bennington Potters to carry pottery, but these gift sets call attention to the fact that they also stock a large selection from Stonewall Kitchen. Food lines like Stonewall Kitchen are a natural for combining with cooking and serving pieces, but you could also add candles, spreaders or small gadgets. If you sell monogrammed products, it’s a natural to combine several items with the same letter on them. With kids merchandise, a unifying them such as dinosaurs will work. A craft shop could put together a kit to get someone started on a new activity. Or you could just combine items based on a coordinated color theme. 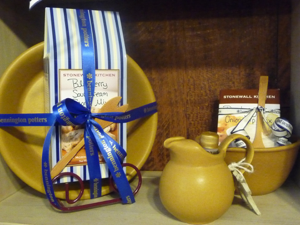 The Bennington Potters gift sets use ribbon with their store name, which has the advantage of reinforcing their branding. But you could use any material that goes with the type of set you are creating. As an added bonus, make it clear that gift boxing and wrapping is easily available. In the busy holiday season, and the rest of the year as well, it helps customers in a hurry if they can see that great gifts are ready and set to go!